As many people in metro Vancouver know, the current taxi system doesn’t work. More often than not, you can almost miss a flight to the airport, can’t hail a taxi on the street when you are rushing to a meeting, or can’t make it home quickly after a night out. We all know the statistics: metro Vancouver is the largest metropolitan area in North America without ride-sharing or ride-hailing services such as Uber or Lyft. But these stats are of little solace when waiting in a never-ending line for a taxi from the airport late in the evening after a 14-hour international flight (along with the Mayor of the local municipality where the Vancouver International Airport is situated). The Province of British Columbia is finally set to deal with ride-sharing by bringing legislation forward this fall — progress that can’t come soon enough. While much ink has been spilled in the Vancouver media on this topic, and political capital used campaigning for or against ride-sharing, there have been valid arguments on both sides. It’s a fact that ride-sharing services have disrupted the taxi industry and the transportation sector in Canada and across the world in recent years, while governments at all levels have scrambled to regulate critical issues such as licensing for passenger and driver safety, fair labour standards, congestion and other urban impacts. This summer, New York City became the first major American city to put a cap on issuing new vehicle licences for Uber, Lyft and other ride-hailing services. Meanwhile, here in Athens, Greece, local legislation was passed in April 2018 requiring that each ride-sharing trip start and end in the fleet partner’s designated headquarters or parking area, and that a digital registry of all ride-sharing platforms and their passengers be created. My understanding is that due to this legislation, Uber quickly suspended its licensed service in Greece. My preference here in Athens, as with any global city, is always to take transit wherever possible — metro, tram, trolleybus or bus. But there are times you just need a taxi, such as when there’s an occasional transit work stoppage, when transporting furniture from Praktiker (the Greek Home Depot) or late at night (even though the Athens Metro has generous hours, Greek events often last well beyond 2 am). Day or night, at any given time yellow cabs are abundant anywhere in the Athens (Attica) region. In five months, I have yet to be stuck downtown or in the suburbs for more than 10 minutes without finding a ride. Every cab I’ve ridden in has been clean, safe (with functioning seatbelts) and air-conditioned (a welcome relief in 40-degree Mediterranean heat). The drivers are professional and courteous; many speak English and are thrilled when you attempt to speak any Greek (the drivers love my husband, who surprises them with his ability to strike up a conversation when they think he only speaks English). As a bonus, the ride is always affordable, and I feel good about contributing to the drivers’ wages, as well as the re-emerging Greek economy. Me and my North American friends and colleagues have also found Beat to be extremely functional and helpful in sourcing cabs. This free app, the product of a start-up developed in Athens, allows you to pay with cash or credit card. It essentially overlays a ride-sharing ‘layer’ on the existing taxi network — turning yellow cabs into Beat cabs. Beat cab drivers all speak English, and the app conveniently translates lengthy and difficult Greek street names. By contrast, in Vancouver, I’ve repeatedly had issues hailing a taxi any time of day. When I’ve needed to catch a flight and tried to pre-book several hours beforehand, the cab has arrived 10 minutes later — only to see the driver leave angrily. I’ve tried using the e-Cab app (shared by all the local Vancouver cab companies), only to find there are glitches with booking or payment. On one occasion, my pre-booked ride was taken by others and I had to foot the bill (luckily only $8 as the app company is located in France and never replied to my refund request — and the cab company wouldn’t help me). In Vancouver, when I finally manage to get a taxi they’re often run down and without functioning seat belts. Many of the drivers are friendly but most almost always complain there isn’t enough business. As the Province takes steps to usher in a new ride-sharing era that works for riders, taxi drivers and owners alike, it should look no further than Athens, Greece. The city makes a fascinating case study on how to meet the needs of visitors and citizens while balancing safety with convenience and fostering local economic development by creating a made-in-Athens solution that other cities such as Lima, Peru are now using. As cities worldwide continue evolving and do their best to manage emerging technologies, we can learn from one another to find solutions that work for everyone. 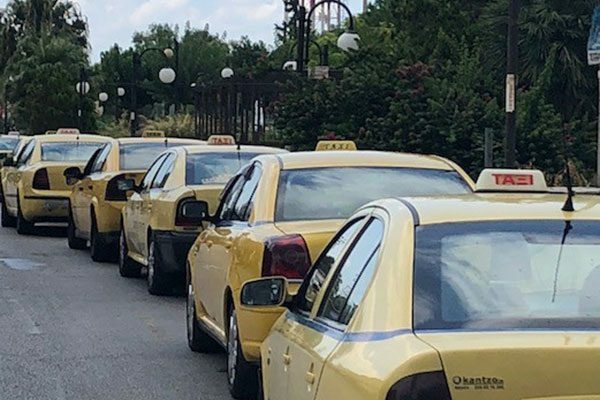 As for me here in Athens, I’m happy to continue supporting the local taxi industry— whether it’s by hailing a cab on the street or using my Beat app. *this piece is based on personal observations and should not be considered policy advice. Marnie McGregor has a Master of Science in Urban Planning from the University of Toronto, and has worked at the City of Vancouver doing government relations, strategic communications, stakeholder engagement and public consultation for over 10 years. Marnie is currently living in Athens, Greece for six months, on sabbatical from the City of Vancouver, working with the City of Athens Resilience Office, SDSN-Greece and Climate-KIC Greece, in addition to volunteering with The HOME Project — a local non-profit organization providing shelter for refugee children. Not sure what all of the solutions are, but we need to be making our roads, taxis and intersections safer. With my daughter approaching driving age now, I find myself worrying about her safety.